Through the decades that I had known Dr. N.A. Baloch, I know him best for his knowledge of culture, history and pre-history of the Indus region, particularly Sindh. His knowledge of Sindhi folklore, language and idioms provided me with new material to reconstruct the picture of the Indus Civilization. Since my research is focused on the images engraved on the Indus seals, I found Dr. Baloch’s approach on this subject to be most logical and his source material most authentic. It is common sense that in order to understand the ancient past of a region one has to first consider the history, culture, languages, scripts and symbols which originated and evolved in that very region. Unfortunately, on this long journey of seal decipherment there have been some detours which have misled the researchers to distant places. Dr. Baloch rightly advises that “For the language of the (Indus) script, the scholars will have to abandon their wild-goose chase of looking for the proto-type in Turan and South India and look for the evidence within the land where the seals were made and discovered…this lock of the Indus script had apparently been prepared by the great smiths of yore that is not likely to yield to such foreign-made keys so easily[ii].” Dr. Baloch has been a strong advocate of the inclusion of Sindhi language in the Indus seal research and as I proceed with my new book on this subject I sincerely feel that his approach has the potential of making a positive contribution towards the understanding of the Indus seals. The mainstream foreign archaeologists may find this whole concept difficult to grasp but it must be shared. 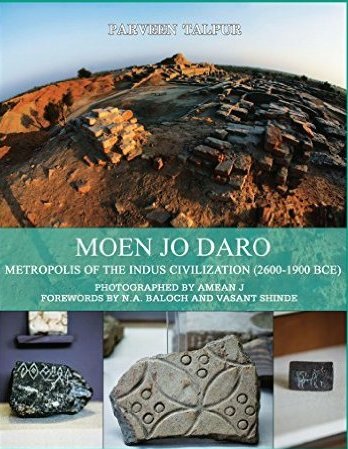 As advised by Dr. Baloch, I have already made a beginning by drawing their attention to this approach in my book on Moen jo Daro[iii]. Dr. Baloch had also guided me on other periods of Pakistan’s past. For this I will have to go back in time to my first meeting with this great man at the National Museum Karachi. It was the last day of 1978, the participants and guests invited at the three day UNESCO Symposium on Moen jo Daro were having their tea-break. I spotted Dr. Baloch, standing next to Dr. Hamida Khuhro, he was conversing with a few participants. I left my husband in the company of the Allchins and walked towards him. I didn’t feel like interrupting and waited for a pause in his conversation. He was a thorough gentleman, for as soon as he saw a lady waiting to speak with him he excused himself and greeted me very warmly. I had no idea that he had already read my article on Chand Morya (Dawn October 13, 1978) and was in fact very supportive of my research. Now that he saw me at an international symposium his opening words were that he is very proud to see for the first time a Pakistani Sindhi woman ready to read a research paper on Moen jo Daro and the Indus Civilization. Apart from a few women guests and two female curators the only other woman archaeologist was Bridget Allchin wife of Raymond Allchin, the well-known husband wife British team who had arrived from the Cambridge University to share their research. My first impression of Dr. Baloch was that he was very attentive during our conversation. The next evening when the Symposium was over and my husband and I were still talking to a few guests in the garden of the Museum, Dr. Baloch was coming out of the parking lot. We walked towards him and in that brief encounter he asked me if I would be interested in applying for the post of a research assistant at the National Commission on Historical and Cultural Research in Islamabad. Dr. Baloch at that time was the chairman of this prestigious Commission of the federal government of Pakistan. I thanked him for his generous offer and at the same time informed him that I am desperately applying to American universities and a few prestigious foreign institutes and if he could help me with that. He advised me that I should also be looking for positions in UNESCO and UN and he offered to write letters of recommendations, a few months later I asked him for a letter. I must mention here that in 2007 I discovered that Dr. Baloch was also a very good record keeper. Through his letters published by the Institute of Sindhology I was pleasantly surprised to see my letter and Dr. Sahib’s response in his book[iv]. For the sake of convenience I am attaching our correspondence published in this book to show the picture of a great scholar guiding a curious student. These letters also provide me with a guideline to write this article. Since my student days, I had been working on the hypothesis that Emperor Chandragupta Maurya (340-297 BCE), who had established the first empire of the Indo-Pakistan subcontinent and who in his last days had abandoned the throne, converted to Jainism and migrated to an unknown destination, had perhaps reached lower Sindh where he spent his last days. My research indicates the possibility that the remote shrine in the Tharparkar district might be his gravesite. My research was already known to Dr. Ishtiaq Khan, the Director General of the Department of Archaeology and Museums, but a few encouraging words of Dr. Baloch really boosted my morales. Since he had personally surveyed the lower Sindh and was familiar with every inch of its land his acknowledgment meant a great deal. In one of his books [v] he recalls his wanderings in Sindh: “As a student of Sindh’s history and folklore, I have roamed around in the Lower Indus Valley of Sindh for quite a few years, seen numerous sites and collected the current lore about settlements of the bygone times. As a friend of the archaeologist, I propose to share, in a layman’s language , information relevant to what I presume to be the potential Indus Culture sites contemporary with or successor to the great city of Moen jo Daro. ..A search for the location and identification of pre-historic sites can profitably be made, mainly along the old courses of the Indus. A guiding hypothesis may be formulated: if one follows the old beds of the Indus and its channels, it is very likely that the prehistoric sites are discovered.” The shrine of Chand Morya, located close to my village in the Tharparkar district, incidentally stands on the bank of the abandoned bed of Puran, an ancient tributary of Indus. Dr. Baloch was also familiar with the most unknown landmarks of Pakistan and he drew my attention to the group of Chandragup mud volcanoes of Baolchistan. I was excited to learn that yet another version of the name Chandragupta exists in Pakistan and because of the sanctity attached to the highest volcano of this group and its proximity to the sacred cave temple of Mata Hinglaj, I found this geographical feature very interesting and relevant to my research. This is just one example how Dr. Baloch promptly came up with relevant information regarding topics on history and archaeology. I had published two articles on the site of Chand Morya, one in the Daily Dawn and the other in the Pakistan Times, the idea was to make my research known to the public but these articles also showed me a path of how to share my ideas on archaeology, history and culture, hence I also got addicted to writing journalistic articles. My plans to work in a foreign institute had failed and freelancing was the only means left for me to keep bonded to the books. I finally felt that I should devote myself to something more academic and thus registered for a Ph.D. at the Karachi University. It was during these years that one day, through the editor of Dawn, I received a letter from Dr. N.A Baloch. It was dated 25th January 1988, almost a decade after our first meeting. Once again he appeared as a guiding light in my life as he suggested that instead of writing articles I should be writing a book on the Talpur History. I was little surprised because of the coincidence as a few weeks ago Justice Mir Khuda Buksh Marri had also made the same suggestion. Justice Marri, the Chief Justice of Balochistan High Court had not only served as the, governor and chief minister of his province, but he had also written the history of Balochs and was keen that the ‘golden period’ of Baloch history under the Talpur rule should be written in English by a Baloch. It was obvious that because of the suggestions of two honorable Baloch intellectuals I will consider the idea very seriously, though I felt little incompetent for such an undertaking. So when I met Dr. Baloch again at an international seminar on Sindh held at the University of Sindh I told him writing a book is a long assignment whereas I am used to writing short articles. I had started the conversation on a negative note but he gave me hope by saying that I should not think I am writing a book, “think of writing just one chapter at a time, think you are writing a long article and call me anytime you need help.” I promised Dr. Baloch that I will write the book. But I did not anticipate that my circumstances will suddenly change and push the freelancing, the Ph.D and the Talpur book on the back burner. In 1997 I made a short visit to Pakistan and made sure to meet Dr. Baloch and present to him the draft of my book. He invited me over for a lunch at his bungalow in the old campus of Sindh University. The bungalow was located on a huge yard in the city of Hyderabad. It had an aura of peace and it was hard to believe the way it maintained such quietness in the heart of the city. This was the first time I visited Dr. Baloch’s house and met his wonderful wife Adi Khadija, a professor by profession and a very warm person. I found them to be a very hospitable couple. The lunch was very delicious and they even asked me to stay overnight as it will be tiring to return to Karachi on the same day. After the lunch three of us sat in the drawing room and the conversation revolved around a variety of subjects. I asked Dr. Baloch a few questions but to avoid shop-talk never for once did I bring any reference to the Talpur book. He answered questions politely and in detail. I asked his opinion about a few people and he answered without any hesitation which showed his honesty. In this homely atmosphere I found Dr. Baloch to be a very interesting conversationalist. A year or two later I had a few telephonic conversations with Dr. Baloch when he and Adi Khadija were visiting their son Fareed in USA. It was during this trip that I also emailed him my final draft. The book was finally published by Ferozsons in 2002. And then in 2003 I made the most sad call to Dr. Baloch, Adi Khadija had passed away, it was a condolence call. In the brief conversation I could feel the pain of his loss but he was going through the tragedy in a very graceful manner. In December 2006, Dr. Baloch was the chief guest when I made a presentation on the Indus Seals at the Pakistan Study Centre, University of Sindh, Jamshoro. It was during this event that he suggested the idea of writing a book on Moen jo Daro for general readers. The idea was very well-timed as I was to spend the year 2007 as a visiting professor at the Sindh University and this was to provide me the opportunity to revisit Moen jo Daro and enough time to receive guidance from Dr. Baloch. I will never forget Dr. Baloch’s gesture of kindness when he visited me and my husband at the University’s guest house. He visited along with his daughter Adi Hamida and grandson Arshad Baloch, who I always saw on the side of Dr. Baloch on each university event he attended, surely Arshad is the upholder of the Baloch legacy. Adi Hamida gave me a gift of beautiful Sindhi prints and told me about the school that her great father had established in their village, I always knew that he believed in educating the younger generation of Pakistanis. The verse appeared to me as a lost letter unearthed from an ancient port town which could be Bhanbhore, Lothal or even Moen jo Daro. I began to read the Risalo as a source of history and archaeology. Latif’s Bhanbhore, a flourishing emporium, where Sassui and Punhoon played their destinies can very well be mistaken with any ancient Indus city. I felt the verse had bestowed life to the deadness of archaeology and I explained these thoughts in greater details in my book[vii] on Moen jo Daro. Dr. Baloch also believed that Moen jo Daro is a much larger city but in view of the continued ban on excavations, he had already suggested horizontal excavations to the relevant authorities. Incidentally, a couple of years later, UNESCO also suggested similar excavations in order to establish the limits of the ancient city. I came to know many more dimensions of Dr. Baloch’s life and personality through his book “World of Work” which I received in my office at the Pakistan Study Centre, Sindh University Jamshoro. It was a fine spring afternoon of April 2007, I had just finished preparing the next lecture and therefore, had time to browse through it. There was an envelope that came with the book, inside was a letter requesting me to write a review of the book. The letter was by Dr. Shoukat Shoro the publisher of the book and director of the Institute of Sindhology. I am so thankful to Dr. Shoro for giving me this opportunity as the book gave me a chance to know more about Dr. Baloch’s life. Dr. N.A. Baloch needs no introduction. He is known to all for his vast knowledge on a variety of subjects and for his passion for quality education to the younger generation of Pakistanis. For me he will always remain a mentor who put me on the path of writing books and who always acknowledged my work. It was very kind of him to refer to me always as “Dr. Talpur.” One day I took the courage to remind him and said “Dr. Sahib, it’s so nice of you to call me “Dr. Talpur” but I have not earned a Ph.D.” He replied quickly: “But you have done more research than a Ph.D holder.” This was an overwhelming acknowledgement. I was unable to say a word and after this I never even thought of a Ph.D. degree. [ii] N.A. Baloch. Deciphering Indus Script. http://archive.org/stream/DECIPHERINGINDUSSCRIPTDRNABALOCH/DECIPHERING%20INDUS%20SCRIPT%20DR%20N%20A%20BALOCH_djvu.txt Accessed on September 2012. [iv] N.A. Baloch, “World of Work: Predicament of a Scholar” Institute of Sindhology, University of Sindh, Jamshoro, 2007. [vi] Parveen Talpur, “Evidence of Geometry in Indus Civilization 2500-1500 BCE” ” Institute of Sindhology, University of Sindh, Jamshoro, 1994.